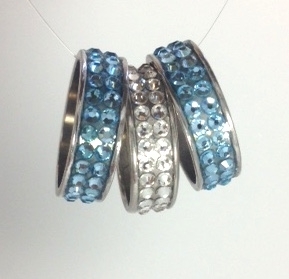 Fun and sparkly stackable channel rings in your favorite colors! Made of sterling silver with rhodium over plate to prevent tarnishing. Available in full sizes 6 - 9. The photo features handset Swarovski crystals in clear and aqua. EACH RING IS SOLD INDIVIDUALLY.